The Vernier Chloride Ion-Selective Electrode is used to measure the concentration of chloride (Cl−) ions in aqueous samples. Prepare the electrode by soaking it in the High Standard solution for 30 minutes. Perform a two-point calibration using the High and Low Standard solutions. Soak the electrode in the High Standard solution (included with the ISE) for approximately 30 minutes. Important: Do not leave the ISE soaking for more than 24 hours. The ISE should not rest on the bottom of the container, and the small white reference contacts near the tip of the electrode should be immersed. Make sure no air bubbles are trapped below the ISE. Important: If you plan to use the electrode outside the range of the standards provided, you will need to prepare your own standards and use those for soaking and calibrating. Note: If the ISE needs to be transported to the field during the soaking process, use the Short-Term ISE Soaking Bottle. Remove the cap from the bottle and fill it 3/4 full with High Standard. Slide the bottle’s cap onto the ISE, insert it into the bottle, and tighten it. For long-term storage, greater than 24 hours, make sure the sensor is stored in its storage bottle with the sponge slightly damp. Connect the Chloride ISE to an interface, and connect the interface to your computer. Open Logger Pro. Choose Calibrate from the Experiment menu and then click . High Standard Calibration Point: The Chloride ISE should still be soaking in the High Standard. The ISE should not rest on the bottom of the container, and the small white reference contacts near the tip of the electrode should be immersed. Make sure no air bubbles are trapped below the ISE. Enter the concentration value of the High Standard (e.g., 1000 for 1000 mg/L) in the edit box. After the voltage reading for Reading 1 stabilizes, click KEEP. Low Standard Calibration Point: Remove the ISE from the High Standard, rinse well with distilled water, and gently blot the ISE dry with a paper towel. Place the ISE into the Low Standard. Make sure the ISE is not resting on the bottom of the container, the white reference contacts near the tip of the electrode are immersed, and no air bubbles are trapped below the ISE. Enter the concentration value for the Low Standard (e.g., 10 for 10 mg/L). After the voltage reading stabilizes (~2 minutes), click KEEP. To save the calibration to the sensor, follow the steps below: Note: ISEs must be calibrated frequently. If saved, this calibration should be for short-term use only. Click the Calibration Storage tab at the top of the dialog box. Click to continue. Click to complete the process. Connect the Chloride ISE to LabQuest. Choose Calibrate from the Sensors menu and select Calibrate Now. High Standard Calibration Point: The Calcium ISE should still be soaking in the High Standard. The ISE should not rest on the bottom of the container, and the small white reference contacts near the tip of the electrode should be immersed. Make sure no air bubbles are trapped below the ISE. Enter the concentration of the High Standard (e.g., 1000 for 1000 mg/L) for Reading 1. After the voltage reading stabilizes, tap Keep. Enter the concentration of the Low Standard (e.g., 10 for 10 mg/L) for Reading 2. After the voltage reading stabilizes (~2 minutes), tap Keep. Tap Save Calibration to Sensor. Tap OK. Tap OK to complete the process. Connect the Chloride ISE to an interface, and connect the interface to your Chromebook. Open the Graphical Analysis app. Click the live readouts meter in the lower right hand corner. Choose Calibrate. Click Apply to complete the calibration process. Note: Properly soaking and calibrating the ISE is required before taking measurements with your ISE. For detailed calibration procedures, refer to the Calibration section of this user manual. Make sure the sensor is properly calibrated. If the meter has a reading of 1.0 mg/L and the sensor is not in a 1.0 mg/L solution, you need to calibrate. After calibration, rinse off the tip of the ISE and blot it dry with a paper towel. Insert the tip of the ISE into the aqueous sample to be tested. Important: Make sure the ISE is not resting on the bottom of the container, the white reference contacts near the tip of the electrode are immersed, and no air bubbles are trapped below the ISE. Note: Do not completely submerge the sensor. The handle is not waterproof. Hold the ISE still until the reading stabilizes and record the displayed reading. Note: With some aqueous samples, especially those at high concentrations, it could take several minutes for the reading of the Chloride ISE to stabilize. If you know the approximate concentrations of your samples, it is best to analyze them from lowest concentration to highest. Chloride ions are found in freshwater samples as a result of water flowing over salt-containing minerals. These salts might include either sodium chloride (NaCl) or potassium chloride (KCl). The EPA maximum contamination level for chloride concentration in drinking water is 250 mg/L. The chloride ion concentration in seawater is approximately 19,400 mg/L—well below the upper limit of the Chloride ISE of 35,500 mg/L. The Vernier Chlorine Ion-Selective Electrode (ISE) is a membrane-based electrode that measures a specific ion (Cl–) in an aqueous solution. When the membrane of the electrode is in contact with a solution containing the specific ion, a voltage, dependent on the level of that ion in solution, develops at the membrane. The ISE is a combination style electrode. The voltage develops in relation to an internal Ag/AgCl reference electrode. The ISE measures for the specific ion concentration directly. Samples need to be aqueous to avoid contaminating or dissolving the membrane. The Vernier Chlorine Ion-Selective Electrode has a solid polymer membrane. The membrane is a porous plastic disk, permeable to the ion exchanger, but impermeable to water. It allows the sensing cell to contact the sample solution and separates the internal filling solution from the sample. The voltage developed between the sensing and reference electrodes is a measure of the concentration of the reactive ion being measured. As the concentration of the ion reacting at the sensing electrode varies, so does the voltage measured between the two electrodes. where E is the measured voltage, Eo is the standard potential for the combination of the two half cells, m is the slope, ln is the natural logarithm, and a is the activity of the measured ion species. 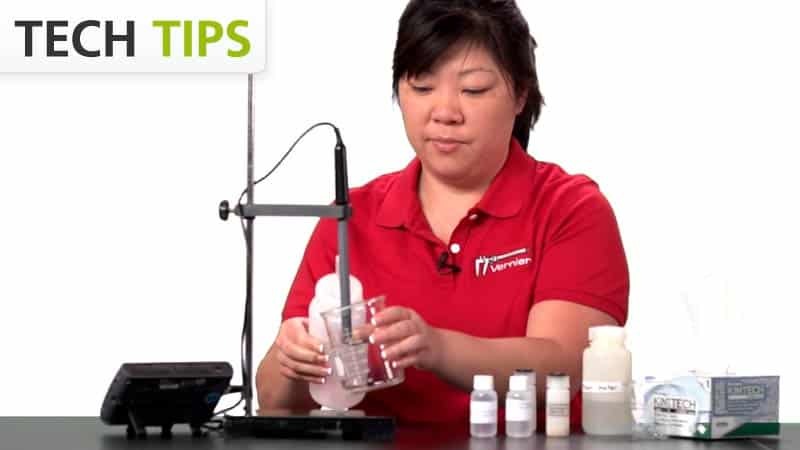 If you have watched the related product video(s), followed the troubleshooting steps, and are still having trouble with your Chloride Ion-Selective Electrode, contact Vernier Technical Support at support@vernier.com or call 888-837-6437. Support specialists will work with you to determine if the unit needs to be sent in for repair. At that time, a Return Merchandise Authorization (RMA) number will be issued and instructions will be communicated on how to return the unit for repair. Vernier warrants this product to be free from defects in materials and workmanship for a period of five years from the date of shipment to the customer. This warranty does not cover damage to the product caused by abuse or improper use. This warranty covers educational institutions only. ISE modules are covered by a one‑year warranty.